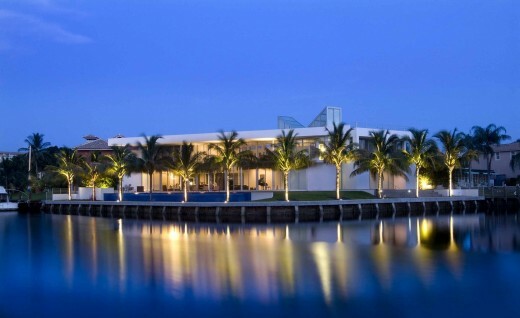 Situated in a residential community on a third of an acre waterfront site, Lighthouse Point House features 180-degree vistas to the west, northwest and north where three waterways join and lead to the Atlantic Ocean. 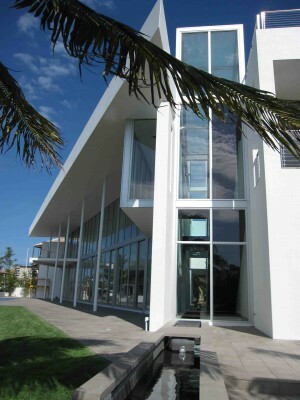 One enters the wedge-shaped site, which fans out to the water, from a cul-de-sac at the end of a linear street lined with one and two storey waterfront homes. The footprint consists of two distinct geometric sections, a two-story rectangle and two-storey triangle connected by a two-storey high glass atrium with a glass butterfly roof that serves the entrance and the vertical circulation of the house. A 110-foot long linear reflecting pool starts from exterior entry, flows through the atrium, continues to the waterway and ends in a negative edge. 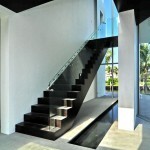 This provides a visual and spatial link between the entry, the interior stair and the waterway beyond. 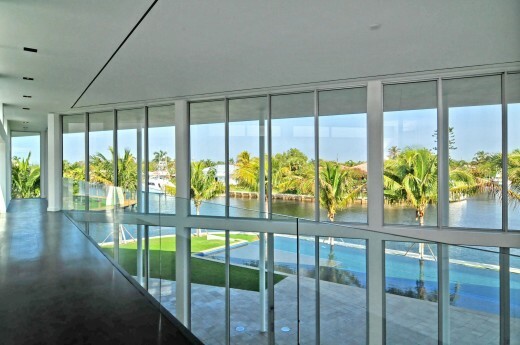 The two-story entrance provides a framed view through the living room to the waterways beyond, and is transected by a second level ebonized clad bridge and walkway. 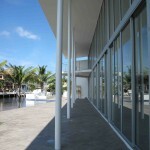 On the south side of the entry and walkway are the private living areas. To the north, the public areas open onto the terrace and a 75-foot long negative edge pool. From the first floor the direction of the stair is towards the waterway and leads to a walkway that takes you through the exterior terrace facing the waterway, then runs along the double height living room. From the living room your choices are to continue along the double height space that ends at the master suite or cross the atrium to the bedrooms on the south side or go up another flight stairs that lead you to the roof deck with 360-degree views of the waterways. The glass butterfly roof, terraces, and open spaces enable a dramatic interplay of light and shadow both inside and outside of the house. 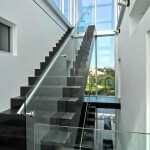 The sky-lit entrance hall and the main rooms are composed together in a dynamic yet simple layout. 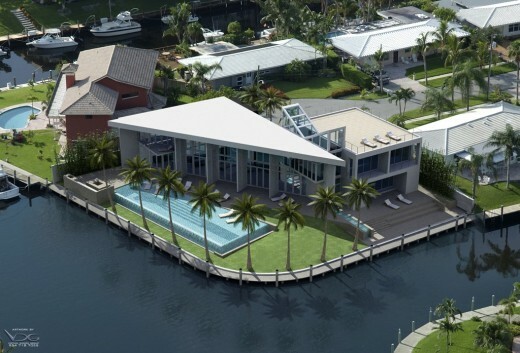 The triangular section contains a two-story living room, dining room, kitchen, and second-floor master suite; and the other section incorporates a 3-car garage and family room/library on the ground floor, and the children’s bedrooms on two floors. 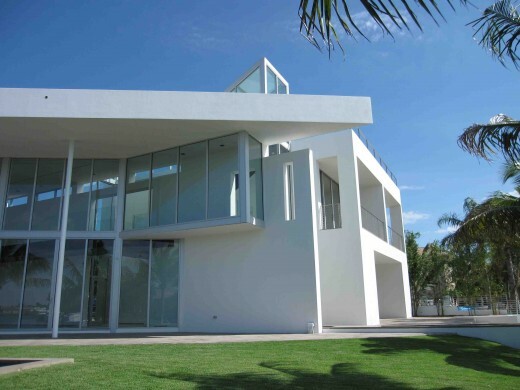 The details on both the interior and exterior of the house are minimal and precise. 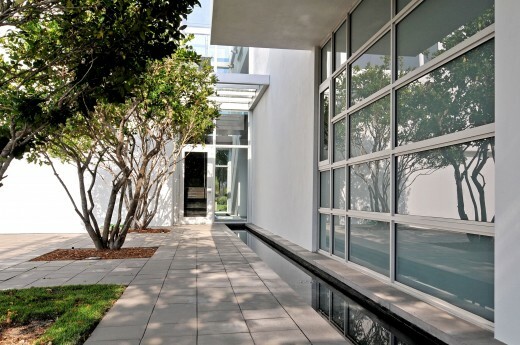 Materials include glass, steel, aluminum, wood, limestone, and plaster – all of which are in hues of white (with the exception of the ebonized wood) and carefully balanced and juxtaposed with each other.